Five years of civil war in Syria has taken a serious toll on the country. More than 250,000 people have died as a result of the conflict according to the UN, and millions have fled the county in search of better lives abroad. Once thriving cities are now decimated, and Syria’s rich cultural history is under constant threat. Since the civil war began, groups on both sides have exploited Syria’s cultural heritage. Multiple UNESCO World Heritage sites have been damaged, destroyed, and/or looted, with some used as strategic positions by the Syrian Army. Arguably the most famous UNESCO site in Syria, Palmyra, has been held hostage by Daesh since the Syrian Army retreated last May. Daesh has blown up several structures at the site, including its famous arch. The war has had a significant impact on the illegal antiquities trade. Sites have been made completely vulnerable to illegal excavations, and looted antiquities have flooded the black market. While Daesh is largely responsible for the ransacking, multiple groups fighting in the war have been found to be engaging in illegal excavations to fund their military operations. Established laws have helped in stopping the importation of illicit antiquities, but shutting down the market has been virtually impossible. 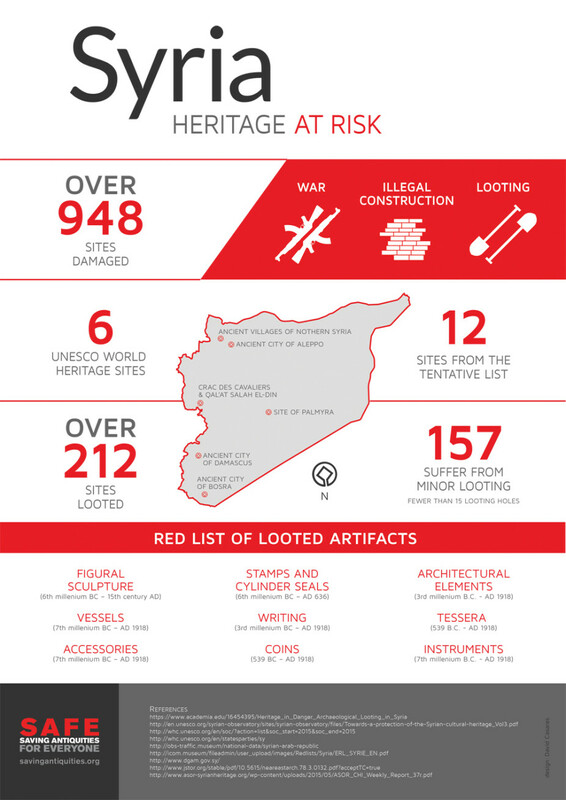 Saving Antiquities for Everyone presents this infographic to put the data on cultural heritage at risk in Syria into perspective. It is our hope that this visual presentation provides a real understanding of the threats facing cultural heritage and the devastation’s impact on Syria’s history and identity. It shows how too many sites, including UNESCO World Heritage Sites, are at risk in Syria. In addition, the infographic provides an overview of the types of objects that have been looted from sites in Syria and are currently on the black market. (Left) 948 sites total have been damaged in Syria since the beginning of the civil war. (Right) These sites have been damaged from war, looting, and illegal construction. (Left) 6 UNESCO World Heritage Sites have been damaged or destroyed. (Right) 12 sites that are being considered as UNESCO World Heritage Sites have also been damaged or destroyed. (Right) 157 have suffered from minor looting (fewer than 15 looting holes). These are the “red-listed” artifacts often looted from sites in Syria. They have showed up on the illegal antiquities market and have been confiscated in various police raids. This infographic will be available to download in high-resolution on SAFE’s website: (http://savingantiquities.org/safe-resources/). Share this infographic on social media using the hashtag #HeritageAtRisk. Print it out and post it around in your community. Join our Facebook page and get involved!